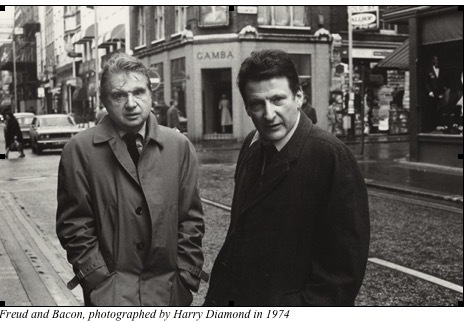 For a quarter of a century, Lucian Freud and Francis Bacon were the closest of friends. Their lives were characterized by an intense mutual scrutiny of each other and each other’s work, resulting in some extraordinary paintings and a deep but volatile relationship. When they weren’t painting, they spent much of their time at the Gargoyle Club (and later the Colony Room) in London’s Soho, drinking, gambling and arguing. They would sometimes run into other members of bohemian circles, such as Jean-Paul Sartre and Simone de Beauvoir. Freud later recalled memorable instances such as waking up with his head in a toilet in one of their Soho haunts. In the studio, they constantly scrutinized each other’s work, offering comment and criticism but not always liking what they saw. As Bacon later put it, “Who can I tear to pieces, if not my friends? 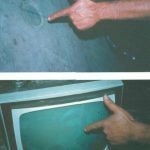 …If they were not my friends, I could not do such violence to them.” As two figurative artists working at a time when abstraction was the pervading fashion, their practices drew on these mutual processes of looking and criticizing to inform their painting. However, although they were painting in the same tradition, their ways of working couldn’t have been more different. 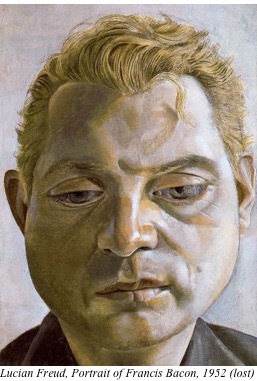 When Lucian Freud first sat for a portrait by Bacon in 1951, he was fascinated by the older artist’s hurried and spontaneous approach. 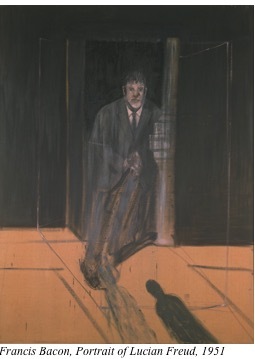 Bacon’s paintings of Freud bear little physical resemblance to the sitter, but instead depict something closer to a psychological sketch or essence. 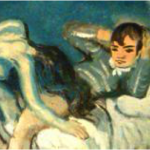 Conversely, when Bacon sat for Freud the following year he was amazed at how long Freud took with the painting. Bacon sat consistently for three months. For Freud, however, this was fast work; in 2007 he finished a portrait that had taken 16 solid months to complete. Sadly, Freud’s portrait of Bacon was stolen in 1988 when it traveled to an exhibition in Berlin. Freud later designed a “wanted” poster for his missing painting, and posted them around Berlin in the hope that it would be found, but it remains lost. 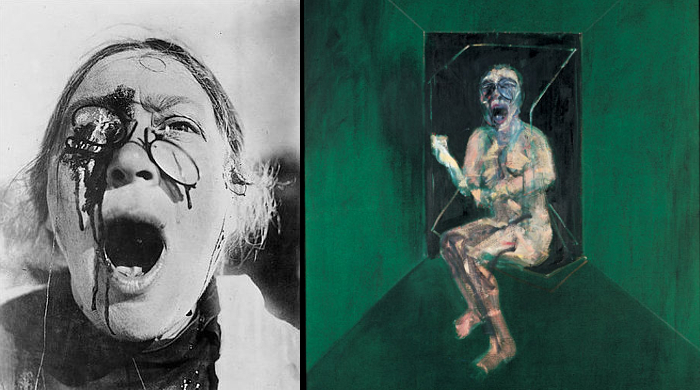 Learn more about Francis Bacon and Lucian Freud on the Art Story artists pages. This entry was posted in Existential art, Expressionist Art, Relationships of Artists and tagged francis bacon, Freud and Bacon, London Modern Art, Lucian Freud on May 19, 2016 by Madeline Kessler. Postwar Irish painter Francis Bacon (1909-1992) is infamous for his detailed depictions of figures’ mouths, often wide open and screaming. But, his colorful shrieks are more than imaginative. Bacon was an ample researcher, and some pretty gruesome real life images are hidden in his artworks. 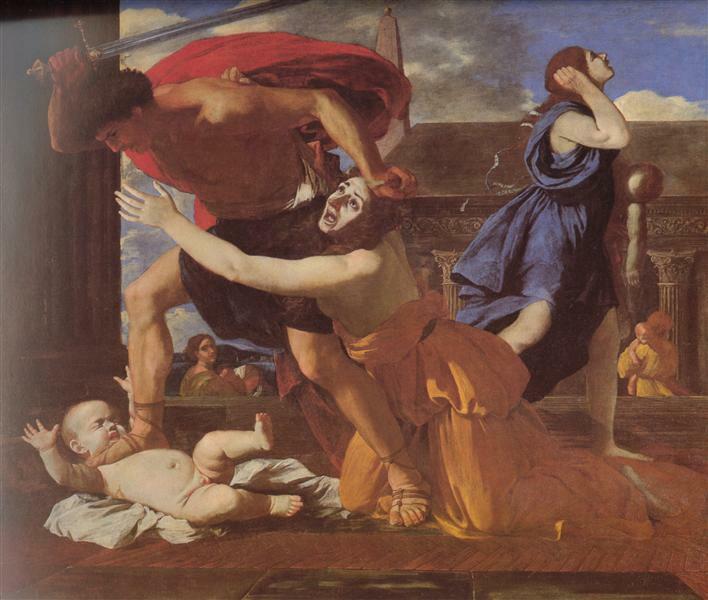 “The Massacre of the Innocents,” Nicolas Poussin, 1628-1629. Bacon’s oral fascination grew when he moved from Ireland to Chantilly, France at age 17. Absolutely no spam, we promise! Popular culture also permeated Bacon’s obsession with a trip to the art movie house. The film “Battleship Potemkin” was a self-proclaimed “catalyst” for his artwork and the cry of an Odessa nurse would be direct inspiration later in his career. Left: Image from “Atlas-Manuel des maladies de la bouche,” first edition 1894. Right: Three Studies for Figures at the Base of a Crucifixion, central panel detail, Francis Bacon, 1944. Finally, he scoured the libraries of Paris for a scientific authority. In Atlas-Manuel des maladies de la bouche, a French translation of an 1894 German medical textbook, Bacon found his ultimate source material: hand-colored plates of various mouth diseases in all their sore-filled, slobbery glory. These diseased and distorted oral images would shape the creative canon of this existentialist artist for the next six decades. 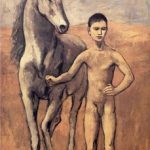 This entry was posted in Existential art, Expressionist Art and tagged battleship potemkin, francis bacon, oral fascination, postwar painting on February 4, 2015 by wpuser.